StemCell RoboSep 20000 Automated Magnetic Cell Separation Isolation Cytometry . New Life Scientific, Inc. The StemCell RoboSep instrument utilizes immunomagnetic particles to perform positive and negative separation of cells based on target cell surface antigens. For positive separation, the magnetic particles cling to the targets and then the EasySep magnetic field is activated, pulling the cells of interest in one direction and allowing the user to pipette off the supernatant solution. Inversion of the magnetic field allows for additional negative selection, separating out the unwanted cells. The cell separation technology is better explained in the manual provided below in the table link. This RoboSep is in excellent cosmetic and functional condition; this product was acquired from a third party and arrived in exceptionally clean condition. New Life Scientific staff noted that this instrument has minimal signs of use. The technicians attached the tubing and reagents required to test the Robosep. The robotic arm and carousel are mechanically intact and fully-functional, positioning the tip head correctly and homing with ease. 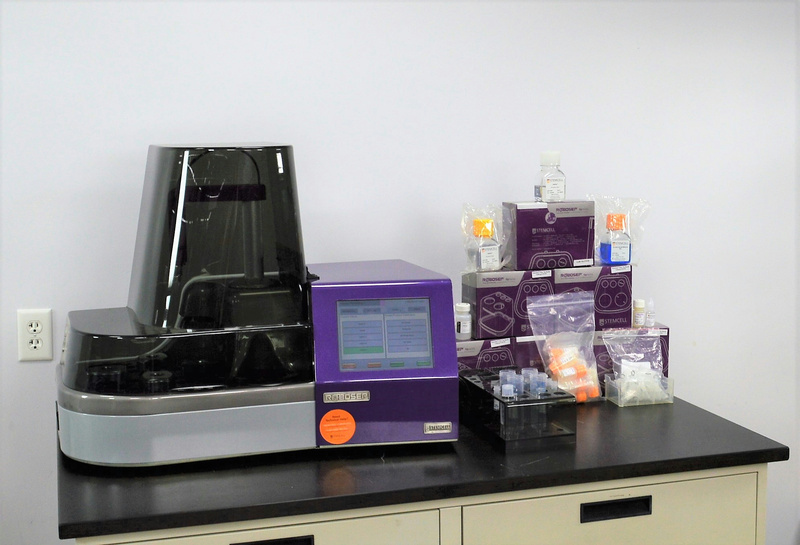 The end-users will need to purchase consumables and reagents relevant to their application; New Life Scientific does not stock reagents or consumables and has included everything that was originally acquired with the RoboSep. Please see the table below for a list of catalog numbers and included sealed and opened consumables. The internal log and reporting system dates back to June 2011, presumably from the first calibration, but the technicians did not quantitate the hours or tests that this system has performed. This instrument includes a used-working product warranty and we ask that you contact New Life Scientific for details. For any product questions, feel free to contact us--we are here to help!